Lochside Apartments are 2 purpose built, luxury self-catering properties with a 5 star rating from Visit Scotland situated in the heart of the picturesque 'Food Town' of Castle Douglas. With Lochside Park and Carlingwark Loch just on your doorstep, then beyond with stunning views to the hills of Screel and Bengairn, Lochside Apartments are unique and an ideal base from which to explore the surrounding countryside and the bustling market town of Castle Douglas. Castle Douglas boasts an array of independently run shops which have a wide selection of local arts and crafts, clothing and footware, hand-made jewellery and gifts galore. There are also plenty of cafes and restaurants to tempt the taste buds if you would like to eat out, many serving local produce. For the sweeter tooth there is a selection of locally made food, from ice cream to hand-made chocolates. The town has several pubs and even its own brewery for those who like a tipple. All this gives the town its own unique charm, not found in many other high streets nowadays, with something for every visitor. Galloway is an ideal destination for an energetic or relaxing break with stunning countryside and Britain's largest forest park. The Galloway Forest Park boasts 300 square miles of natural beauty to be explored and with the park recently receiving the status of being one of only four 'Dark Sky Parks' in the western world. Also in Galloway are 5 of the famous '7 Stanes' mountain biking trails, fishing, hill walking, bird watching, water sports, golfing and plenty of family activities to be enjoyed. The area has an array of natural heritage sites, gardens and places of historical interest with Castle Douglas having its own picturesque gardens and country house, with historic castle. Threave House and Gardens are located only 1/2 mile outside of the town and Threave Castle is located about 2 miles away - both are well worth a visit. Both apartments share a private drive with car park which leads to the front patio of each apartment. In the front patio you will find the bike store for those guests wishing to bring their own bikes. There is also a hose in case you need to wash your bike down after a hard day on the 7 Stanes trials. The BBQ and table and chairs are also in this patio which is an excellent place for a BBQ on a warm evening. Ground floor - There are two well equipped bedrooms, both with wall mounted flat screen TVs and built in DVD players, vanity area, ipod docking alarm clocks and ample wardrobe and drawer space. Each bedroom can be made into either a twin or double room (with a super king bed), with high quality, 400 TC, 100% cotton bedding. One of the bedrooms has French doors leading out onto a large patio area, which has clothes drying facilities and one of the bedrooms has a safe to store valuables. Also on the ground floor is the main bathroom which is fully tiled with over bath shower, demister mirror, heated towel rail and modern furniture. In the entrance hall there are coat hooks and a shoe storage rack with complimentary slippers. The washer/dryer and ironing facilities are located under the stairs. First floor - There is a bright open plan living/kitchen/dining area leading out through floor to ceiling bi-fold doors onto the large balcony area. The kitchen boasts a range of modern appliances and equipment for all your needs, including dishwasher, fridge freezer, induction hob, microwave, fan oven, coffee maker, George grill and ample crockery and glassware. The living area consists of two leather sofas which look out over Lochside Park, solid oak furniture, 42 inch flat screen TV with satellite channels, ipod docking stereo, dining table and leather chairs with ample space for four people. The balcony is a large area which once the bi-fold doors are open doubles your living space and with the Rattan sofa, chairs and table on the balcony gives you a perfect area for relaxing and enjoying the magnificent views. The shower room is also on the first floor and this comprises of a large shower enclosure, modern furniture and backlit mirror. 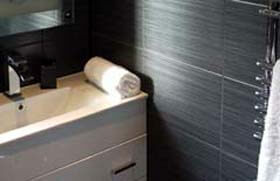 The shower room is also fully tiled. Both apartments are finished to the highest standards with oak flooring on the first floor, gas central heating keeping the very well insulated apartments nice and cosy and oak doors and finishings throughout. All the outside areas are partitioned between both apartments so you can enjoy your privacy but if you are in a large family or group and rent both apartments then there are gates which can be opened so your friends/family can move between the two apartments. The gates will be locked at all other times. On entering Castle Douglas head down the town's main shopping street (King Street) until you come to Moore's Chip Shop at the bottom. Turn left, then at the crossroads turn right and Lochside Apartments are the first drive on your left. Included in the price is electricity, gas central heating, free WiFi, luxury 400TC 100% cotton bedding (beds made up for arrival), luxury towels, BBQ charcoal and a luxury welcome pack including milk, tea, ground coffee, sugar and a selection of local produce to help you settle in. These 5 star self-catering apartments are rented out all year. Change over day is Saturday, check in 4pm check out 10.30am. Short breaks are available - please contact for details. 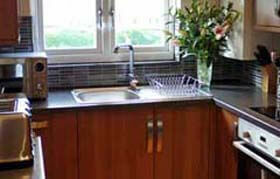 10% discount for larger parties booking both apartments. To enquire about availability for these five star self-catering apartments in Castle Douglas, click the enquiry button below and see availability and prices. - These five star self-catering properties overlooking a loch in Castle Douglas are perfect for a Galloway holiday. 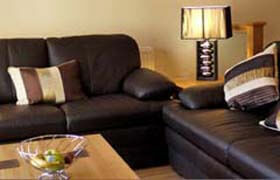 Each apartment sleeps 4 and is beautifully equipped with modern furnishings. Castle Douglas is known as Scotland's Food Town and there are an array of great shops, cafes and restaurants in the town - just minutes' walk from the holiday apartments.